With Prince Harry and Meghan Markle tying the knot at Windsor Castle this Saturday, what better excuse to head to London to soak up all the excitement? Celebrate the romance of the decade with seven quintessentially British experiences from some of the country's best-loved establishments. Just a stone’s throw away from Kensington Palace you will find a white stucco luxury hotel on the appropriately named Queen’s Gate where they take the art of etiquette very seriously. In this sumptuous establishment, you can learn how to become a princess, but with champagne and canapes on tap. So practise writing like a royal with an expert calligrapher, arranging flowers with Saint Floral, improving your aptitude for interior design with Rockett St George, and even learning how to be a hostess worthy of Oscar Wilde. Essential self-improvement for anyone heading to Windsor with the hope of bagging a prince. As any Londoner will tell you, Dukes Bar is infamous for serving the city’s most potent—and most delicious—martinis. Housed in a luxurious Mayfair hotel of the same name, it was James Bond creator Ian Fleming’s favourite bar. Staff only allow each client two martinis before they’re told to go for a walk around St James Park to clear their head. This spring, this old-world hotel is branching out from Mayfair-based martini madness by offering guests the chance to drive to Windsor in a vintage Rolls-Royce for an exclusive behind-the-scenes tour of the castle and village. Afterwards, you’ll have dinner in Dukes’ glamorous dining room—martinis included at all stages, of course. Modern train stations are rarely glamorous places. But as you make your way towards the burgundy Belmond Royal Scotsman, a handsome, kilted piper leading the way, you might reconsider that. This is the kind of train that makes you yearn for the past. Each time you step on board, sit down for a meal or move in such a way as to suggest you’re awake, attendants appear holding trays of something delicious and boozy. Cabins are plush, dinners are strictly black-tie, and on your journey from Edinburgh to the Highlands, you’ll stop off at a number of Macbeth-worthy castles, including one near Balmoral. Waltzing around the ballroom of the Ritz to a live band while waiting for your lobster dinner to arrive—does it get any more glamorous than that? Well, yes. 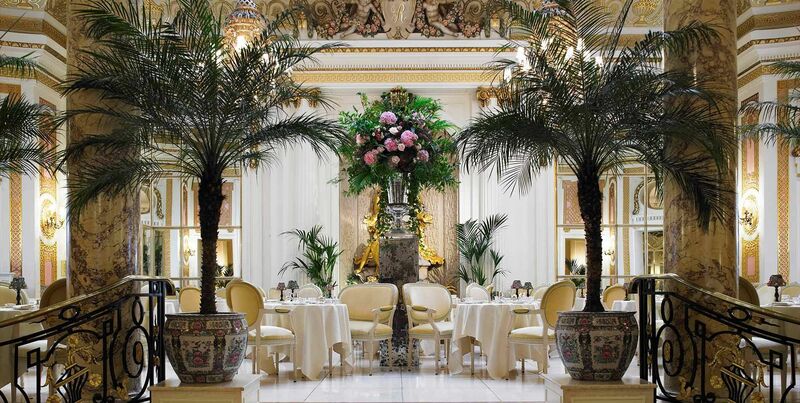 We assume any royal wedding guests will be back in town for the London season, so see it in style with the Ritz. After a night of dinner and dancing, the next day you will be chauffeur-driven to the Royal Flower Show, Royal Ascot or Wimbledon, depending on dates, for a day of sipping champagne, dining on gourmet lunches and filling up on scones and jam in the most rarified of enclosures. A little weary after mingling with the aristocracy all day? Order dinner in bed in your magnificent suite. Staying at the grand Four Seasons Hampshire already feels a bit like being a character in Downton Abbey. So why not take it one step further by visiting nearby Highclere Castle, where the series was filmed? Arrive in a style even Lady Mary would approve of, with a chauffeured Rolls Royce, and learn of Highclere’s secret history, full of aristocratic intrigue. Follow that with a sauna and a swim in the Four Seasons’ swimming pool, whose Olympic scale would be sure to inspire envy even among the Crawleys. London and gin have long been intimately associated, so much so that the city has a famous historical period called the Gin Craze and an entire category of the spirit is named after it. No wonder the clever people at the Rosewood realised their celebrated Gin Bar, the largest of its kind in the city, would be the ideal spot for a gin masterclass. It serves more than 400 different gins and 27 branded and homemade tonic waters, so guests can choose from an impressive 14,035 G&T pairings while they learn about the city’s infamous gin palaces. Great fun—and ideal small-talk fodder for when you’re at the palace. Before the arrival of Heathrow, the upper classes would take to Bath to rejuvenate after a long season of hunting, shooting and fishing. And the Royal Crescent Bath, the grandest hotel in the west of England, has revived that tradition with its world-class spa. It’s impossible to come away from its salt-infused saunas, vast relaxation pools and inhalation rooms feeling anything other than glowing after a weekend in this gorgeous hotel. Couldn’t be bothered driving back to London? Take the helicopter instead.